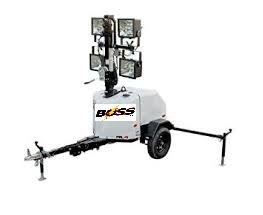 30 FOOT 4 LIGHT LED PORTABLE LIGHT TOWER with Electric Powered with 4 x 400w LED floodlights. Lighting system will illuminate 1.0 acres at .5fc. Tower is capable of rotating 360*. Manual winch tower with galvanized steel winch cables. This unit must be used for axillary power. 1600 watts of electrical power. 1-20amp 120v, 1 20amp 240v RV type Trailer Receptacle. 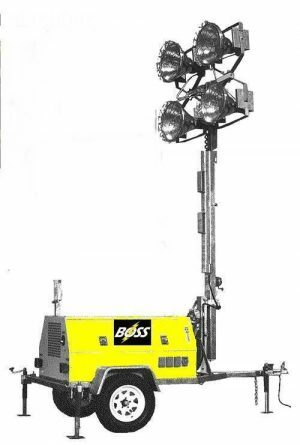 Bossltg is a Light Tower Modifier of OEM Brand Light Towers. 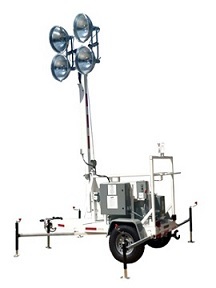 DIESEL powered light towers are used where noise pollution is a safety consideration. Light Tower powered 120/240v,1ph, 60hz, requiring 5kw of Utility electrical power. Control Panel with individual Light Switches, trailer has 2000lb rated axle, 13 in. tires with white spoke rims and power coated Fenders. DOT towing package. Plastic enclose to protect electrical. METAL HALIDE light tower products that have a specific application in the portable light tower industry. METAL HALIDE creates natural day-light illumination. Crisp clear light for job-site task working clarity. This cost to use this MH light source in LESS expensive compared to the LED FLOODLIGTS. It is true LED can produce what seems to be more light per watt against Metal Halide. More light over a smaller area. LED has limited candle-power. The ability to project light over distance. Where Metal Halide is used in a true Floodlight. With this, MH can be projected sometime several times further in distance than compared LED fixture. In considering LED to MH – if your project calls for less than 200′ x 200′ area lighting requirement LED will produce the best working light. If you require floodlighting over several acres only Metal Halide can produce this. 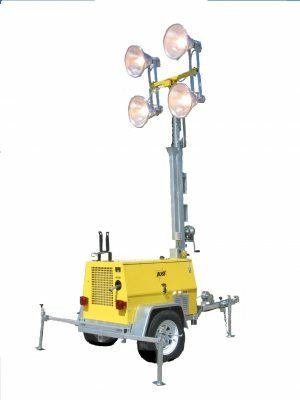 The 23 FOOT DIESEL 6K POWERED PORTABLE METAL HALIDE LIGHT-TOWER has its place on small construction site lighting requirements. 12 units per truck load.